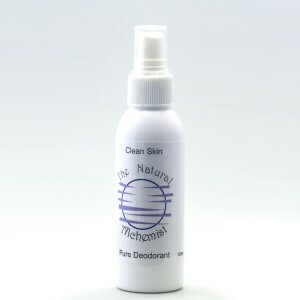 Clean Skin Deodorant is a light aromatic pure deodorant made with your health in mind, especially designed to rid you of odor while allowing the body to function normally. See more info. One 100% natural & organic essential oils and IT WORKS! Combining essential oils of; bergamot, clary sage, thyme, rosewood, lemon, lavender, mandarin and other ingredients designed especially to give you the protection you need without harming yourself. This deodorant has NO harsh chemicals, 100% Aluminium Free, No Aluminium chlorohydrate, NO aluminium ore which is called bauxite or crystals from mineral salts of Bauxite. No Testing on Animals. Ingredients: Organic Neroli hydrosol, witch hazel, denatured ethenol alcohol, bergamot, organic clary sage, thyme lemon, rosewood, organic lemon, lavender, mandarin.